JOHANNESBURG (AP) — A South African man convicted of the murder of a woman during her Cape Town honeymoon accused the woman’s husband of organizing the killing during testimony at his trial Wednesday. Mziwamadoda Qwabe appeared as a witness at the South African trial of Shrien Dewani, who was charged with murder this week after fighting extradition from Britain for several years. 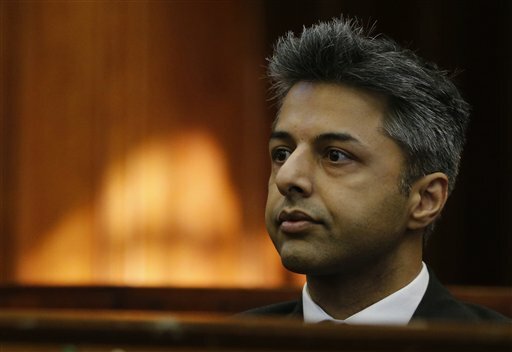 Prosecutors allege that Dewani conspired with Qwabe and two other men to kill his Swedish wife, Anni Dewani, and to try to make the murder look like a botched carjacking. Qwabe told the court that he was hired as one of the hitmen by the Dewani’s taxi driver, Zola Tongo, and that Tongo told him “somebody wanted somebody to be killed.” Qwabe testified that he was instructed to make the murder look like a hijacking. Qwabe, Tongo and another man, Xolile Mngeni, were all previously sentenced to long prison terms for the killing. On Monday, Dewani pleaded not guilty to murder, kidnapping and other charges. His lawyer read out a statement in which Dewani described his relationship with his wife as loving even though they often argued. He also said he was traumatized by her death. Dewani said he and his wife were kidnapped at gunpoint in Cape Town. He said he was forced out of the car, and the alleged assailants drove off with his wife. The car and the body of Anni Dewani were found the next day.